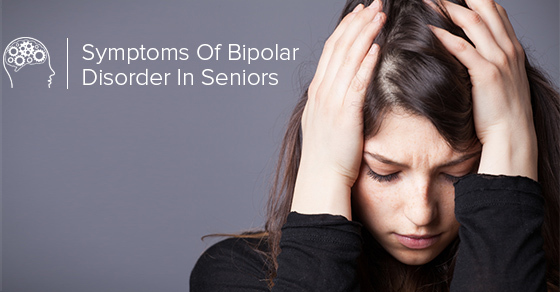 While bipolar disorder is more common among young people, it can also surface in older adults. According to one study, 25 percent of patients diagnosed with bipolar disorder were over the age of sixty. In a separate study, many older individuals who had bipolar disorder had experienced symptoms as early as the age of 40. It is not as easy to detect symptoms of bipolar disorder accurately in older adults due to the high probability that these symptoms can be signs of other illnesses common to older adults such as depression, dementia or stroke, but certain behaviours are usually exhibited. Older individuals suffering from bipolar disorder will likely exhibit restless or irritable behaviour as well as depression. Seniors exhibit notable changes in judgment, memory, perception and problem-solving. Although symptoms of mania are not as common in seniors, they can take on characteristics that are unique to seniors when they do occur. Diagnosis is difficult to detect in older adults due to its similarity with other illnesses common in seniors. Treatment often comes in the form of drugs, but this tends to be particularly tricky due to drug interactions. The best medication is the one that has the greatest effect with the least side effects. Counselling and talk therapy can also be useful, since bi-polar disorder can be connected to a number of factors including the patient’s individual experiences in life. If you know someone who may be suffering from bipolar disorder, you should get as much information as you can from trusted sources. Your family doctor should be the first person to talk to about it. You can also read authoritative websites and books on the subject. The better informed you are the more effective your actions will be in combating bipolar disorder in the patient.